Jnanasutra was born to a low caste family in Kamashila, eastern India. He became a scholar and travelled to Bodhgaya where he met Vimalamitra. They became close friends and, as they walked along one day, Vajrasattva appeared in the sky and instructed them to travel to the Bodhi Tree Temple in China to meet Shri Simha. 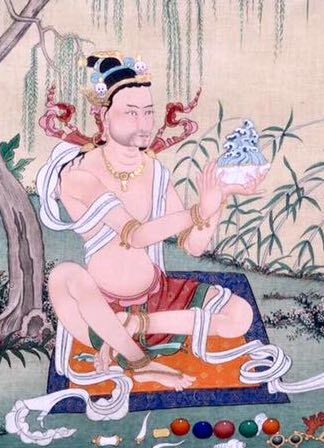 At first, only Vimalamitra obeyed Vajrasattva’s advice and travelled to China. After Vimalamitra had received instruction from Shri Simha he returned to India, bringing the news of his meeting the great master. Jnanasutra was inspired and miraculously made the long journey to China in a single day. When Jnanasutra arrived at the Bodhi Tree Temple, a dakini instructed him to go to the Siljin charnel ground. He served his master for three years and then beseeched him for teachings. He stayed with the master receiving teachings and empowerments for many years. He received all four sections of the Me-ngagde teachings of Dzogchen. During this time Shri Simha often behaved in mysterious ways, wandering in charnel grounds, transforming into various forms, mingling with the dakinis and facing frightening beings without the slightest fear. Eventually Shri Simha told Jnanasutra that the texts of the teachings would appear when the time was right. Seven days after his master left him to visit the King of the country of Li, Jnanamitra saw Shri Simha appear in the sky and knew that he had passed on. He received a casket containing the verses called the Seven Nails and instructions to extract the Nyingthig texts from their hiding place at the Tashi Trigo Temple, and to meditate on them at the Bhasing charnel ground in India. Jnanasutra returned to India with the texts and lived in the Bhasing charnel ground teaching the Nyingthig (Heart Essence) to dakas and dakinis. He also transmitted the teachings to his friend and disciple, Vimalamitra, and entrusted to him the texts of the entire oral tradition. At the end of his life his mortal body dissolved into a body of light. At this time, Jnanasutra appeared to Vimalamitra and bestowed upon him his testament, the Zhakthap Zhipa (The Four Methods of Resting).